Think you know what cute is? You don't. 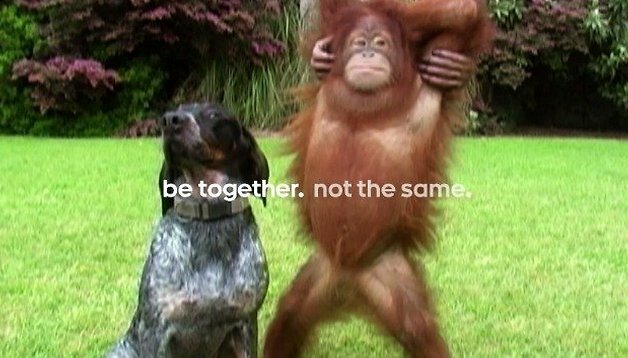 Not until you've seen the latest Android ad promoting the ''be together, not the same'' slogan. Featuring dozens of super cute animals doing even cuter stuff together, all set to the theme music from a Disney classic, Google's new ''friends furever'' ad promises to redefine the internet definition of cute. Rodney Miller performs vocals on the theme song, and it is the same folk tune from Disney's 1973 cartoon, Robin Hood, which featured a fox and a bear having good old times frolicking in the forest together. That was cute enough, but Android has ramped things up a notch in the digital age by taking the best of internet animal cuteness and rolling it into what is sure to be one of the most memorable ad campaigns of the year. Whoever would have thought that orangutans sucked so bad at football? From baby goats unsuccessfully climbing elephants to fluffy ducks snuggling with kittens and dogs, tigers, dolphins, ferrets, turtles and bears, this is a one-minute video of condensed cuteness guaranteed to brighten your day. Just be sure to stay until the end: it's laugh-out-loud hilarious. What's the best ad you can remember? Adorable! I love Android 5.0!